Do you know what’s super cool? When you stumble upon gluten-free deliciousness, and not at all on purpose. That happened to me three times on a lunchtime walk the other day. Three times! Apparently that’s what can happen when you walk around Los Angeles. Who knew? Who knew you could even walk around Los Angeles? Now, you all do. While I didn’t stop to eat there (I had a “Gone Girl” screening to get to) I have made a note, and I WILL go back. Waffles. That’s all it takes to get me all up in there. Next I took a peek at (what I thought was) the Chan Dara menu, as the last time I tried to see if my pre-diagnosis favorite Thai place was safe for me to eat, it was not. But the Hollywood version (rip-off? probably) Chan Darae has gluten-free items on the menu! Not a ton, but enough for me to not have to make my own pad thai all the time. It might not be as rad as the original, but I’m certainly up for trying. After these two rad finds, I thought the hubs and I would return post-movie for a delish gluten-free lunch. But that guy decided to go to the one place in Hollywood that looked absolutely unsafe for me. An artisanal pizza place. I was all, “Peeshaw,” but he walked in to Stella Barra Pizzeria and asked about the gf. And wouldn’t you know it, they make their own gluten-free pizza crust and have been trying to perfect that shizzle. I believe they have. Seriously the best crust I’ve had out and about. 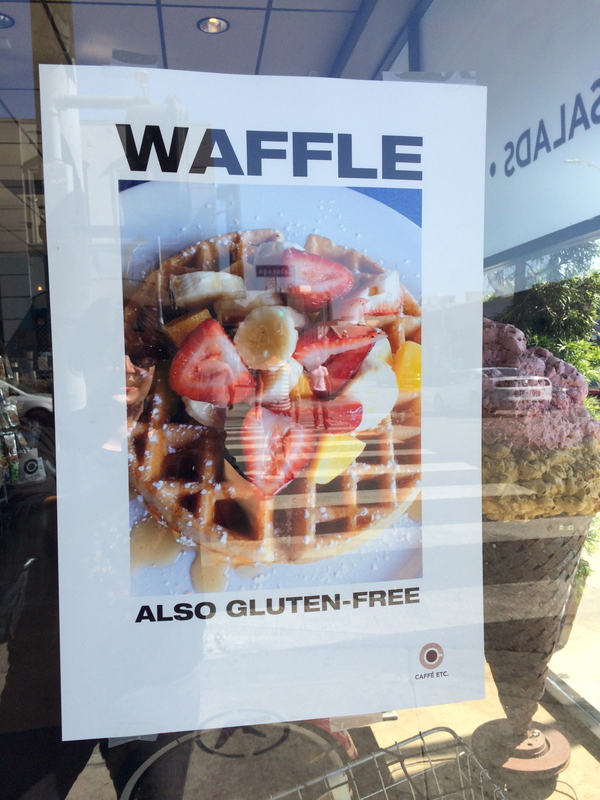 We both had to ask if it really was gluten-free. It was, and it was airy and light and crispy. Pretty exciting stuff, you guys. Oh, but more exciting? They have a secret gluten-free goat cheese bread just for those of us who actually require the gfree. It’s not a secret anymore. So, yes, this is the lesson. Start walking around and poking your head in and asking questions. You might just find some secret cheese bread. I mean, what’s better than that? 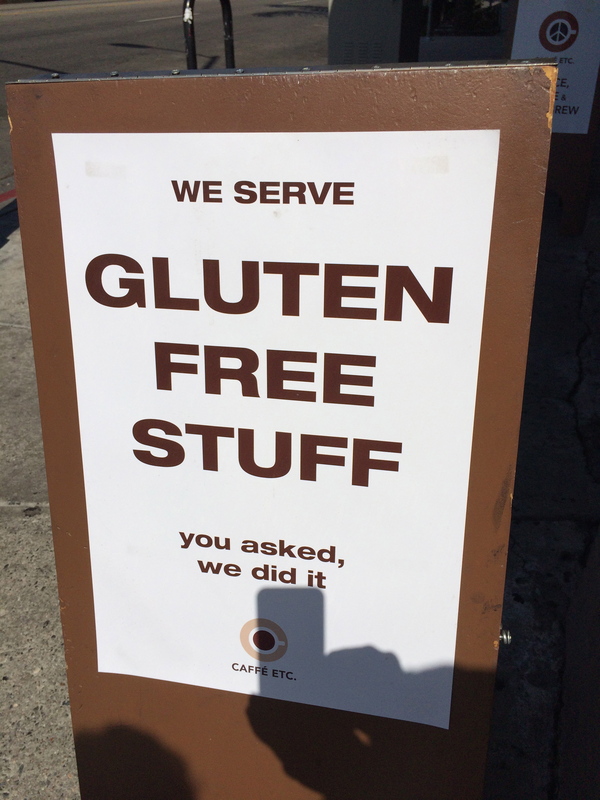 Tags: gluten free dining, gluten free los angeles, gluten free pizza, gluten-free restaurants. Bookmark the permalink. Previous post ← WTF is Gluten Ataxia? Thank you! Will be trying that pizza soon! Last time I went to Stella Barra (this weekend) they told me they cook the GF pizza on the same stone with all of the others! Beware! I had to beg them to cook mine on a separate pan in the oven! Oh no! I’m guessing since I was there at lunch and one of only two tables they were much more accommodating. But it definitely is a great reminder to everyone to ask how your food is prepared. 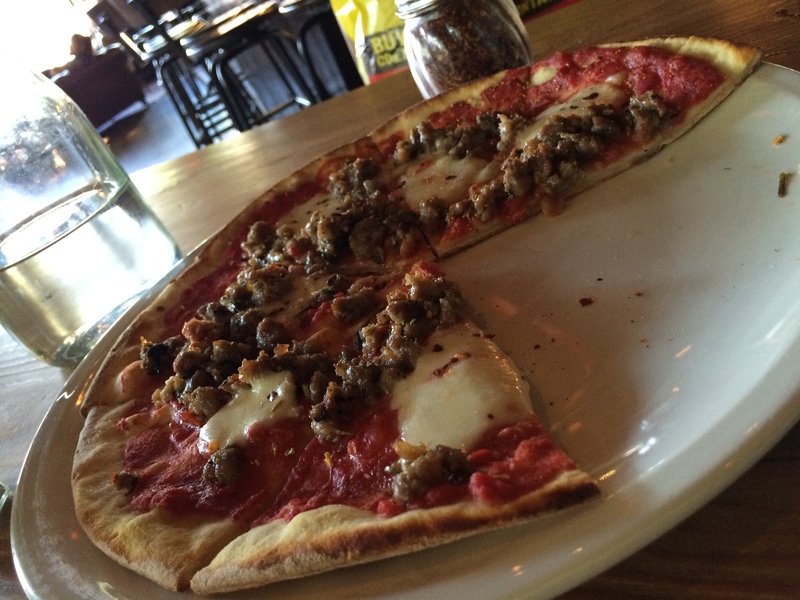 My friend and I tried the GF pizza at Stella Barra last night. We sat at the bar and talked to the bartender, who was slammed with customers, but was very accommodating. After some discussion, we had our GF pizza’s cooked on parchment paper and that worked fine. We had the pepperoni and a margharita with roasted garlic and prosciutto. Fabulous!!! !